Stands of this type with four apertures on the top surface were used by scholars for the storage of ink-sticks and brushes, and were recorded by the late Ming scholar Wen Zhenheng in his famous text, Changwu Ji, 'Treatise on Superfluous Things', Juan no. 7, section 12; cf. Arts from the Scholar's Studio, Oriental Ceramic Society of Hong Kong, 1986, p. 226. 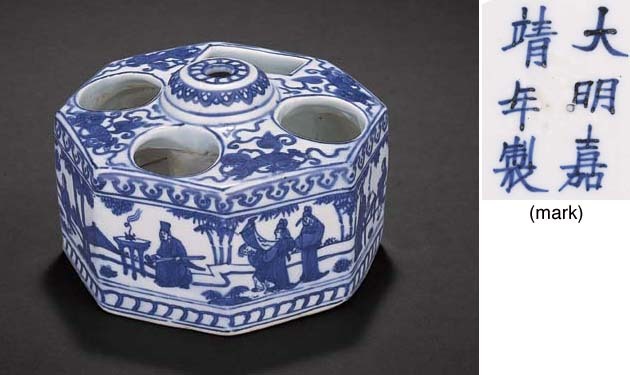 An identical octagonal stand is illustrated by J. Harrison-Hall, Ming Ceramics in the British Museum, London, 2001, pl. 9:33, together with two other circular stands, one with fish and the other with figural scenes, pls. 9:31 and 9:32 respectively. Two other octagonal stands painted with different subjects are published: one from the Percival David Foundation, London, decorated the auspicious emblems, flower and fruit sprays, is illustrated by M. Medley, Illustrated Catalogue of Underglaze-blue and Copper-red, London, 1976, no. B605; and the other, painted with fish swimming in a lotus pond, was sold at Sotheby's Hong Kong, 5 November 1997, lot 1409.